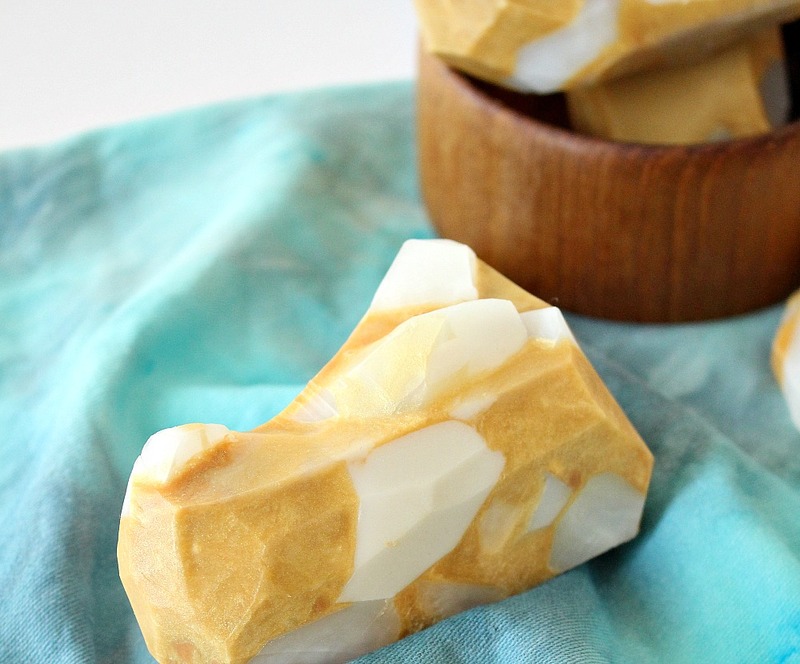 Here’s another variation of DIY soap rocks tutorial. I am just having so much fun playing with melt and pour soap. I’ll admit that I’ve had some flops that never made it to the blog – but even the wonky soaps are lovely because the organic glycerine soap base I use is really luxurious and I am always experiment with really delicious smelling essential oils. So even the silly looking soaps are enjoyed. Whatever it is, it sure is sparkly! And smells delicious. 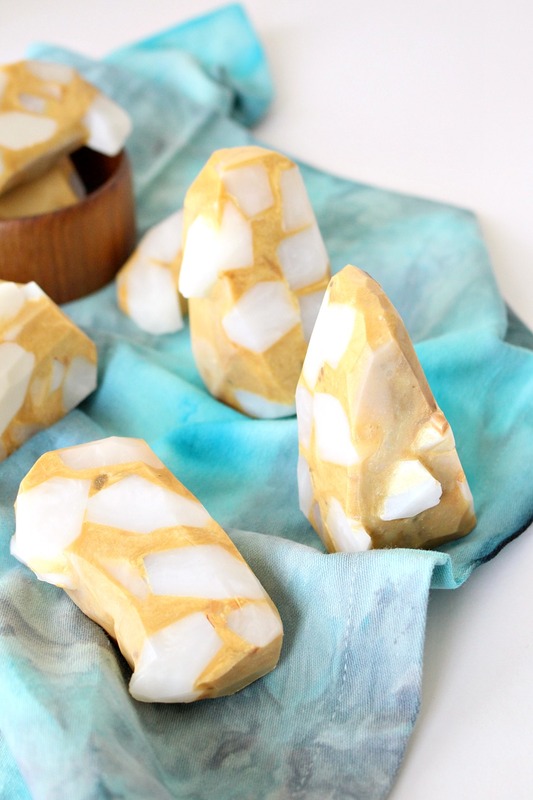 Here’s how I made these crystal and gold DIY soap rocks (following my first DIY gemstone soap tutorial – linked here), plus what I think could improve the design! I cut up about two pounds of glycerine soap base into chunks and added some white mica powder then zapped it in the microwave in my Pyrex measuring cup for a minute or so – until melted. I gave it a quick stir, poured it into my smaller bar silicone molds and let it sit overnight. Then I had these creamy, translucent bars so I chopped them up into irregular “gem” shapes and placed them in my large loaf silicone mold. I chopped up more glycerine soap base and added this gold mica soap colorant in gold (I used all six blocks) before melting it in the microwave. Then I added my essential oil (I used half a tiny bottle of a cinnamon citrus I picked up), poured the melted glycerine over my crystals, spritzed the surface with alcohol, and let it set overnight. 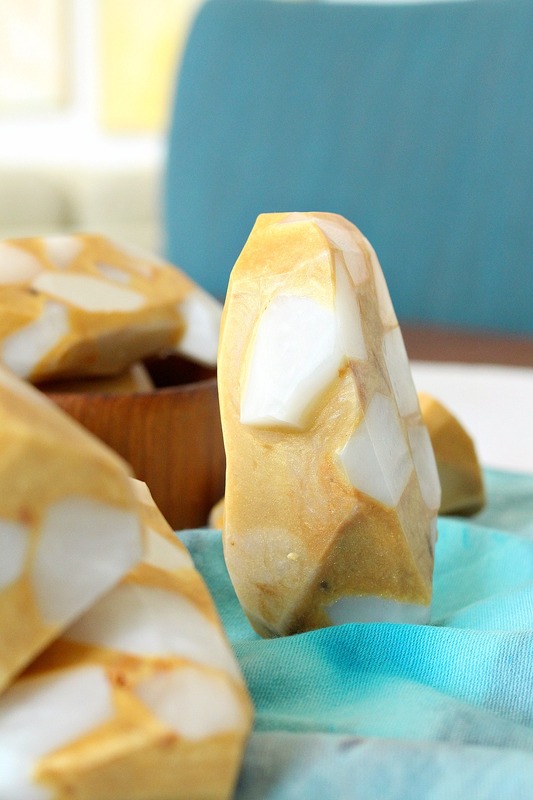 Once I popped out my long bar of soap, I cut large irregular pieces and shaved the edges to look more organic. 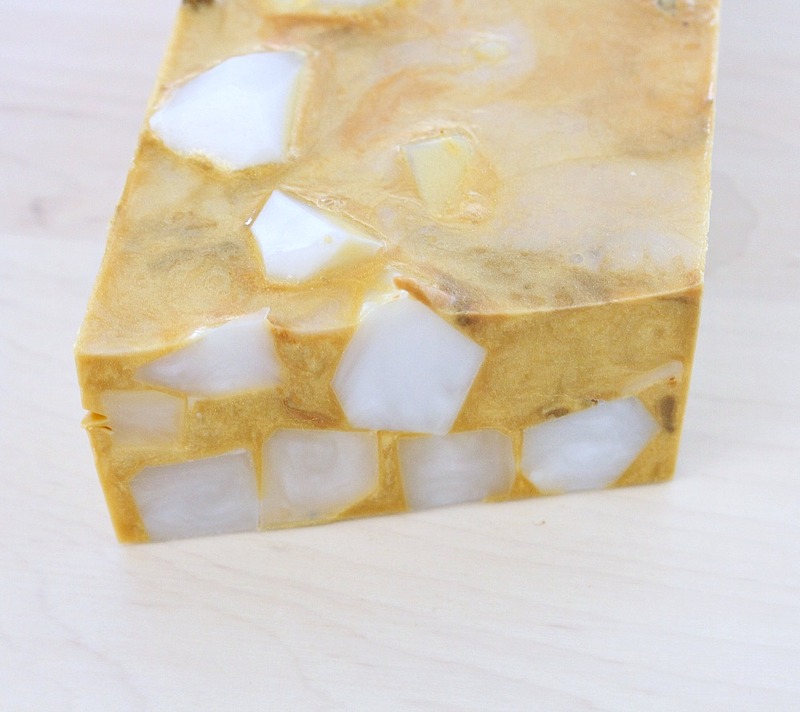 I think the secret to a more realistic gold veined quartz soap would be to increase the size and volume of the crystal chunks so the gold is really just a tiny filler, filling in the gaps. You might have noticed I tried adding some darker bronze and gold pieces for dimension, but that didn’t really have the desired effect. Next time I’ll leave way more crystal spikes poking out the top of my DIY soap rocks, because I loved how that aspect turned out! 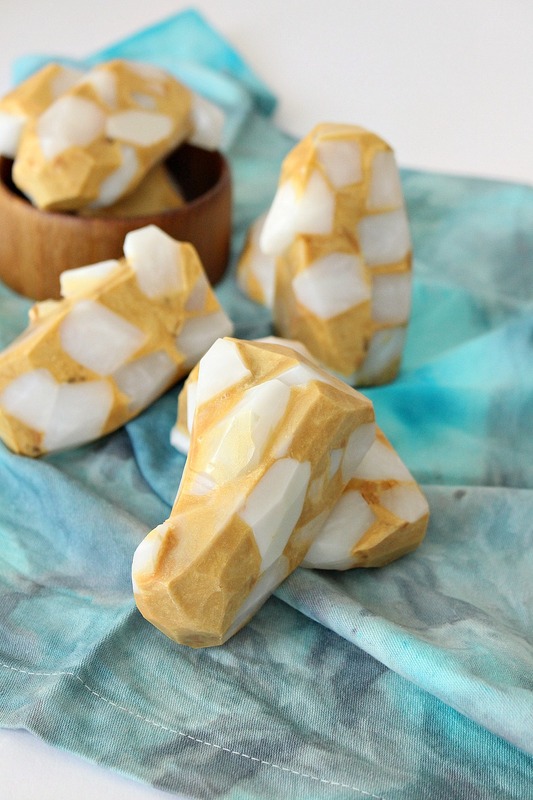 You can always just buy a soap rock – which is how I got hooked on these gems – but making DIY soap rocks is so much fun! Call me crazy, but I think it looks like slices of iced coffee with happy little ice cubes! The first one looks like marble from the quarries near my house. I've been having so much fun making soap after reading your previous soap posts. Our lavender is in full bloom so I'm going to make some lovely lavender bars today. Thanks again for getting me started. 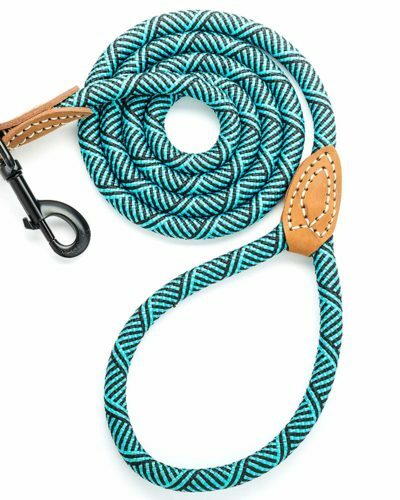 They make such great gifts too. Ooo happy to hear it looks like marble! 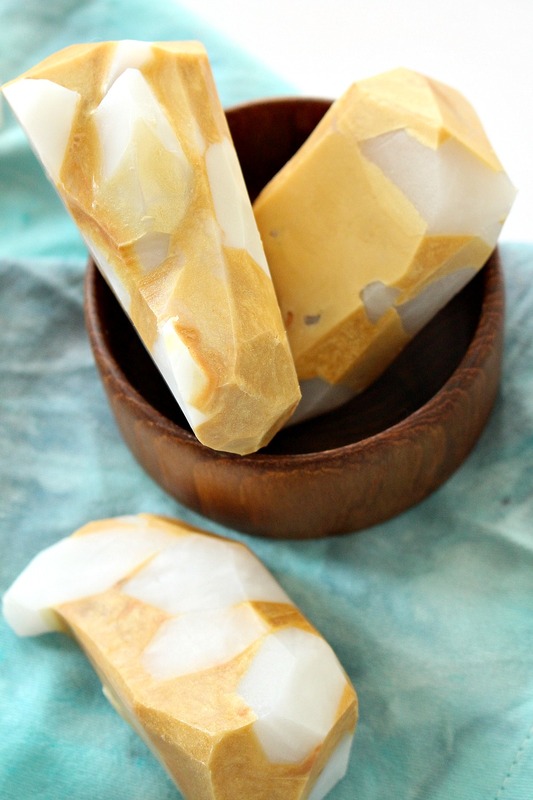 I'm so thrilled you're still experimenting with soap – your lavender bars sound amazing. So jealous things are in bloom there… sigh… soon!